The second film in our series on Studio Ghibli is Nausicaä of the Valley of the Wind. What a weird movie. Seriously, it’s just so strange. But that is definitely not a criticism! I love this movie so much! 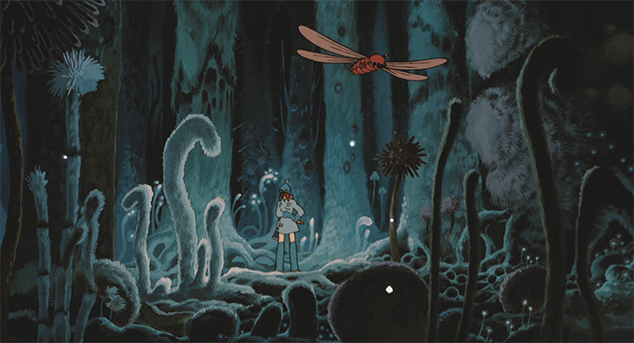 The world of Nausicaä suffered from a very different sort of apocalypse than most, in that it has been poisoned by the evolution of a toxic jungle, brought on by a great war, a thousand years before the events of the movie. After this war, poisonous plants took over the world, and insects evolved to enormous sizes and quickly became the dominant life forms on the planet. One species of these insects, the giant Ohmu, (pronounced Ohm) are featured heavily, and it is hinted that they may have a far higher intelligence than the others. Like The Castle of Cagliostro before it, Nausicaä is also technically not a Ghibli film. It was made before Studio Ghibli was officially founded, but it is a Miyazaki film, and the people who worked on this movie would eventually go on to found Studio Ghibli. 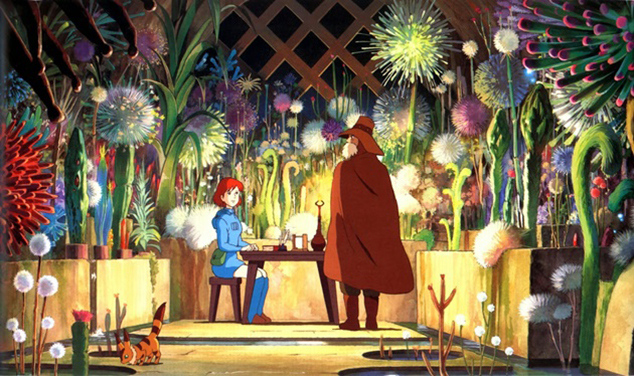 Since its influence was so instrumental in the founding of the studio, most people consider it as a Studio Ghibli film, regardless of exactly when it was made. Nausicaä is also the reason that those of us living in English-speaking countries now get such faithful translations of the films from Miyazaki and Studio Ghibli. Sadly, this is because when it was first given an American release, the film was completely butchered. It was released in English in 1985, but the studio responsible for the dubbing cut out well over 20 minutes of the film and wrote a completely new script. 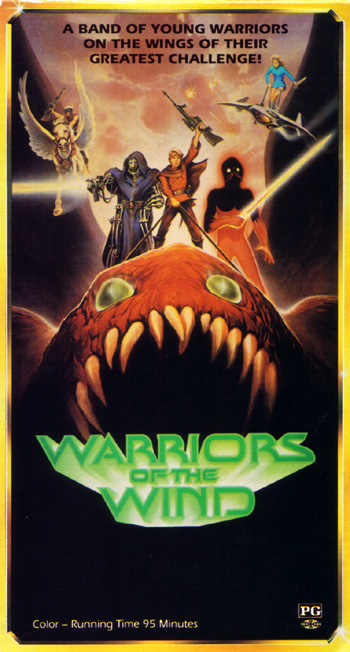 They retitled it Warriors of the Wind and promoted it using posters featuring male characters not even in the film, as well as making it seem like the Giant Warriors, featured very briefly in a flashback, were a prominent feature of the story. Understandably upset with the drastic changes to his film, Miyazaki adopted a strict “no-edits” clause for future foreign releases of all of Studio Ghibli’s films. When the studio got wind that one of the chairmen of Miramax, Harvey Weinstein, was attempting to edit Princess Mononoke to make it more “marketable” in the US, one of Studio Ghibli’s producers sent him an authentic katana with the message, “No cuts.” Since then, the foreign releases have been as faithful as possible to the original scripts. When I first started watching Nausicaä, I wasn’t sure what to think. I hadn’t seen much anime, and it was so different from pretty much any movie I’d ever seen. It was seriously strange, and it didn’t let up on that. Nausicaä was a very weird movie compared to those that I had been used to, but by the end, it had completely won me over. I now regularly cite it as one of my favorite movies of all time. In addition to my own opinion, everyone I have shown it to has liked it as well, even those who generally stay away from films they might deem to be too weird. Nausicaä is beautiful, strange, captivating, and unique. It is a completely different experience than what you are used to, especially if you have never seen any anime, but don’t let that stop you! I know anime can have a stigma, especially among people who have never seen any, but Nausicaä, as well as all the works of Miyazaki and Studio Ghibli transcends what it means to be anime and are works of art, each in their own unique ways. 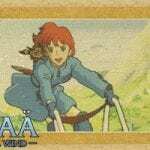 Have you seen Nausicaä of the Valley of the Wind? What did you think the first time you watched it?